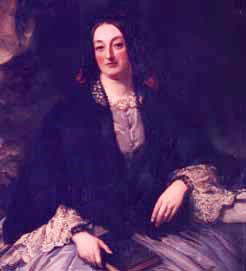 Mary, the wife of the 3rd Earl, was born in 1813 at Heaton Hall, near Bradford in Yorkshire, daughter and co-heiress with her sister, of a wealthy landowner. Her father, having no sons, brought up the girls with an excellent education, which included mathematics and scientific subjects. Mary and William married in 1836. William, was already greatly interested in astronomy, and had ambitious plans to build the biggest telescope in the world. Mary’s money would allow him to do this. She too was interested in the sciences and was well suited to William and understood his plans. The marriage was a happy one. 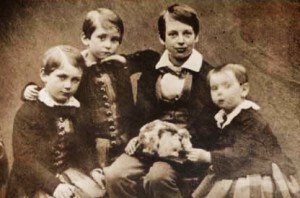 Their eldest child was a daughter, Alice, and then came Laurence, their heir, later to be the 4th Earl, and by 1848 they had three more boys, William and John and Randal. Sadly Alice their only daughter died of rheumatic fever aged eight. After Randal came two more boys, Clere and eventually Charles the youngest who was to be the great engineer. But in 1855 her second son William died aged just 11, and little more than a year later John, her third son, now too aged 11, also died. The deaths of children were a constant spectre in the lives of the Victorian households as so many children did not survive childhood illnesses. Between these children were other births, although these babies did not live more than a few days. Altogether of her eleven children only the four boys, Laurence, Randal and the two youngest Clere and Charles lived to grow up. Mary had started, perhaps tactfully, by photographing her husband’s great passion, the telescope, but she soon moved on to subjects of her preferred choosing, photographing her children and portraits of some of the eminent visitors to Birr Castle. Though sadly very few of Mary’s photographs have survived, those that have show great skill in composition. To quote from David Davison’s book on her work Impressions of an Irish Countess: ‘…her group photographs represent her greatest achievement. The earlier collodion process followed on from Fox Talbot’s negative-positive calotype process, and was the forerunner of modern photographic processes. It was followed by the wet collodion process with which Mary now worked. This was quite difficult, even stressful, in that it required sensitisation immediately before exposure, and development had to be done within the next ten minutes before the coating dried. Although most of Mary’s photographs that we know of were by the collodion process, it is known that Mary preferred, and became well known for, the wax paper process which permitted the photographer to keep the sensitised material for several days prior to exposure. The wax paper negatives became her favourite means of photography: With this waxed paper process she was able to travel with her equipment and even took photographs on board the family yacht the Titania. Unusually for photographers of the time, she also enjoyed landscape photography and took several of town, the river and views of the castle. Sadly none of these paper negatives have yet come to light. Mary’s work earned her the Photographic Society of Ireland’s first Silver Medal, She was the first person, male or female, and to whom it was awarded. The beautiful medal can be seen on display in the Science Centre. She was a member of other photographic groups including almost certainly the Royal Photographic Society in England. And she was the first lady member of the Dublin Photographic society. 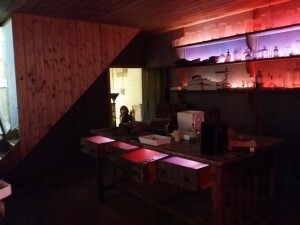 The Dark Room is the oldest in Europe – indeed the world. 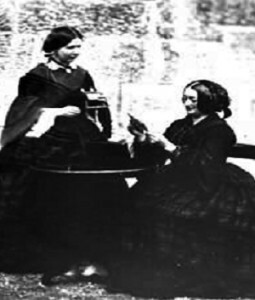 It was established as early as the 1840s when the 3rd Earl began his photographic attempts. He used a room in the old workshop tower above the area where the speculum for the great telescope was brought to be re-polished. Trap doors in floors and ceilings allowed a view from the ground, where the speculum was being polished, to high above the top of the tower where a pocket watch was placed on a flag pole. It is said that when the pocket watch could be read in the mirror, many feet below, it was ready to go back into the tube of the telescope. .Mary used the room extensively for more than a decade, as did her son the 4th Earl until 1908. The room was a photographic time capsule, having lain untouched until 1983, and its rediscovery was an exciting date in the history of photography. The Dark Room has now been moved out of the castle, where access to visitors was been very difficult. It has been completely re-created in the Science Centre, even the floor and ceiling with its trap door was moved. Now you can see it exactly as Mary Rosse left it, with cupboards full of chemicals and the old lead sink.